The below infographic outlines the steps we typically take with our clients during the custom home building process. If a client comes to us with plans in hand or financing already in place, the steps might alter a bit. But overall, this is what you can expect from working with us. The typical construction process takes 6-8 months. All homes include a 1-year builder warrantee after move-in. 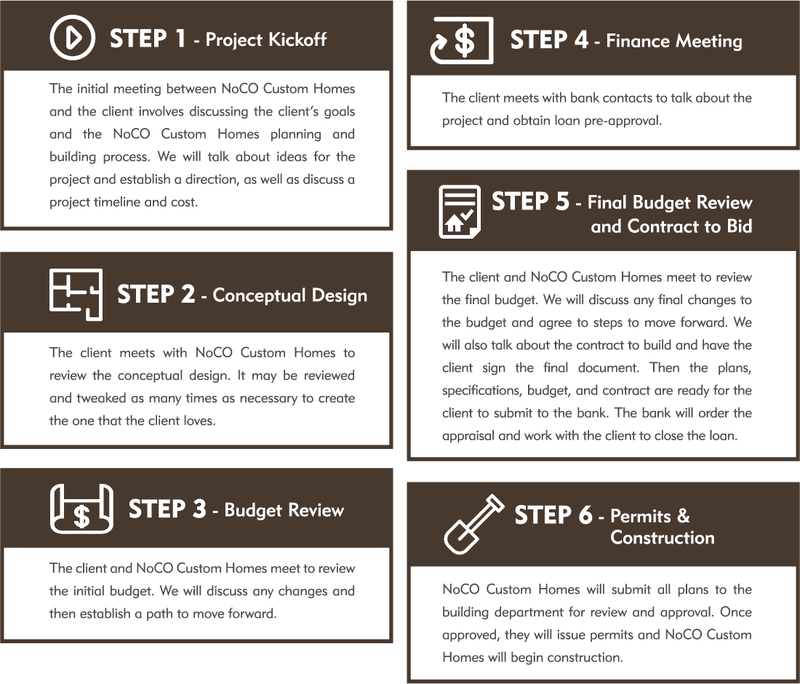 The initial meeting between NoCO Custom Homes and the client involves discussing the client’s goals and the NoCO Custom Homes planning and building process. We will talk about ideas for the project and establish a direction, as well as discuss a project timeline and cost. The client meets with NoCO Custom Homes to review the conceptual design. It may be reviewed and tweaked as many times as necessary to create the one that the client loves. The client and NoCO Custom Homes meet to review the initial budget. We will discuss any changes and then establish a path to move forward. The client meets with bank contacts to talk about the project and obtain loan pre-approval. The client and NoCO Custom Homes meet to review the final budget. We will discuss any final changes to the budget and agree to steps to move forward. We will also talk about the contract to build and have the client sign the final document. Then the plans, specifications, budget, and contract are ready for the client to submit to the bank. The bank will order the appraisal and work with the client to close the loan. NoCO Custom Homes will submit all plans to the building department for review and approval. Once approved, they will issue permits and NoCO Custom Homes will begin construction. The typical custom home building process takes about 6-8 months. All homes include a one-year builder warranty after the client moves in.